The Tarantula Nebula, located about 180,000 light-years from Earth in the neighboring galaxy known as the Large Magellanic Cloud, hosts stars with the greatest masses yet detected. New research examining this nebula suggests massive stars are even more common than previously thought. Heavyweight stars up to hundreds of times the mass of the sun may be more abundant than previously thought, a new study finds. These findings suggest that black holes and other exotic remnants of dead massive stars may also be more common than previously suspected, and that supersize stars may have played a bigger role in the evolution of the universe than previously predicted. Astronomers have long known of stars that are more than 10 times the mass of the sun. The most massive star currently known, R136a1, is about 300 times the sun's mass. Furthermore, massive stars have played a major role in the evolution of the universe. For instance, stars are ultimately the source of the cosmos' "metals" — what astronomers call elements heavier than helium — and massive stars in particular contribute greatly to forging these "metals," study lead author Fabian Schneider, an astrophysicist at the University of Oxford in England, told Space.com. In addition, massive stars possess more fuel than smaller stars do, so they burn hotter, generating powerful radiation and strong winds of charged particles that can influence the fate of galaxies. Prior work suggested that such radiation played a key role in "the epoch of reionization," when the universe emerged from its dark ages. Right after the Big Bang, the universe was a rapidly expanding hot stew of ions, or electrically charged particles. About 380,000 years later, these ions cooled into neutral hydrogen gas. The universe stayed dark until gravity pulled matter together into the first stars. The intense ultraviolet light from this era caused this murky neutral hydrogen to ionize, and the gas has stayed in that state since that time. Once the universe became reionized, light could travel freely through space. However, pinpointing exactly how important massive stars were to that transformation has proved tricky because of the difficulty in studying them. One reason for this is that massive stars are relatively rare — lower-mass stars are more common than higher-mass stars, Schneider said. Another reason is that massive stars have much shorter lives than lower-mass stars do, he added — because massive stars burn hot, they go through fuel quickly and die young. For instance, while the sun is about 4.6 billion years old and is expected to last another 5 billion years or so, the most massive stars may have lifetimes of only a few million years. The scientists used the European Southern Observatory's Very Large Telescope in Chile to analyze the masses and ages of about 800 massive stars in the Tarantula Nebula. 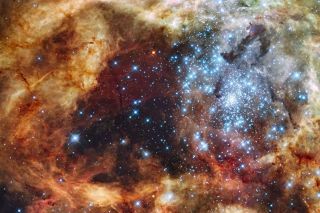 This area, also known as 30 Doradus or 30 Dor, is the largest star-forming region in the nearby universe that astronomers can analyze in great detail, Schneider said. At more than 1,000 light-years wide, if it were only about 1,300 light-years distant, like the local Orion Nebula is, it would be as wide as 60 full moons and shine bright enough to cast shadows on Earth. "Once we realized that 30 Dor hosts many more massive stars than previously thought, we were baffled and thought that we did something wrong," Schneider said. "I would say this was to some extent a chance finding while we were aiming at other questions." The researchers suggested that prior estimates of the number of massive stars might be off because previous research focused mainly on stars of 30 to 40 solar masses or less. In contrast, Schneider and his colleagues examined large numbers of massive stars of up to 200 solar masses in size. "In the past, it has been suggested that stars above 150 solar masses cannot form," Schneider said. But in light of the new study, "it seems likely that stars up to 200 to 300 solar masses can actually form." There are two possible explanations for why there might be a greater number of massive stars than previously thought. One explanation is that the Tarantula Nebula has only 40 percent as much "metal" as the sun, and that lower metallicity can lead to a greater number of massive stars, Schneider said. Another is that the Tarantula Nebula is a so-called "starburst," a region with an extraordinarily high rate of star formation, and that previous generations of stars in the nebula may have heated the clouds in which later generations of stars are born, enabling the emergence of more massive stars, he added. If massive stars make up more of the universe than previously thought, it could have a wide range of consequences across the cosmos, Schneider said. For instance, supernova explosions might happen 70 percent more often than previously thought, and the rate at which black holes form might be 180 percent greater than prior models predicted, he said. Supernovas might also give off three times as many elements as previously thought, he added. Furthermore, massive stars could give off four times as much ionizing radiation as previously thought, Schneider said. "During the reionization of the universe, massive stars most likely played a big role because of their enormous ionizing radiation," he added. Future research should analyze other star-forming regions to see if these new findings hold there as well, Schneider said. The scientists detailed their findings in the Jan. 5 issue of the journal Science.